Established in 1983, Airdrie Meals on Wheels is a non-profit society that provides regular nutritious meals to people who live in Airdrie, Alberta. We offer flexible weekday delivery service during the lunch hour and meals for weekends and holidays when ordered in advance. Dietary restrictions can be accommodated. We strive to accommodate everyone who requests the service. Our clients are senior citizens, persons with disabilities or who have special needs, persons recovering from injury or illness and those whose caregiver is temporarily away. A medical referral is not required. Some insurance plans may cover the cost of the Airdrie Meals on Wheels service. Are you wondering how we’ve been doing over the years? 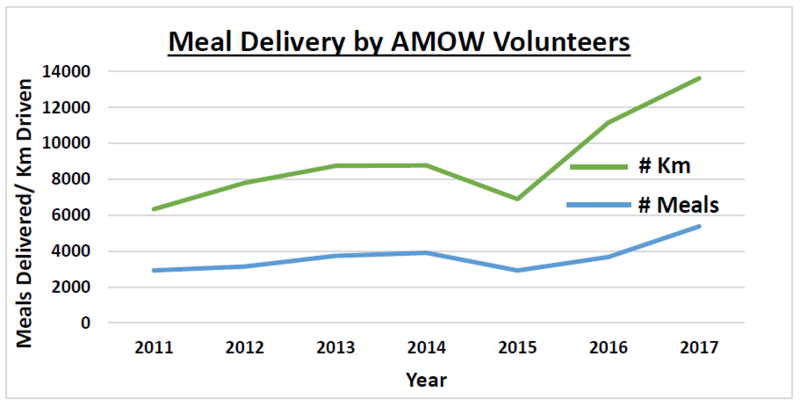 Take a look at what our volunteer meal delivery drivers have accomplished since 2011. Our volunteers have delivered more meals and driven farther with each passing year. Unfortunately, the cost of meals has increased as well, and we need your support to continue serving the Airdrie community, helping those who can no longer shop or cook for themselves. For 35 years Airdrie Meals on Wheels has delivered meals without interruption, without missing a scheduled delivery, and we are prepared to continue this service long into the future. But we need your help. With your support, Airdrie Meals on Wheels will continue to deliver nutritious meals to those requiring the service. Please help us, and the Airdrie community, by donating generously today.